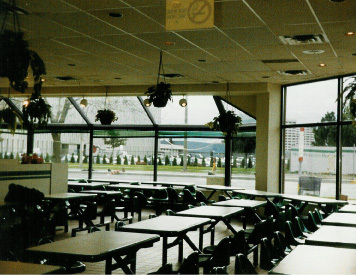 The first restaurant to open was the Victoria Park location. 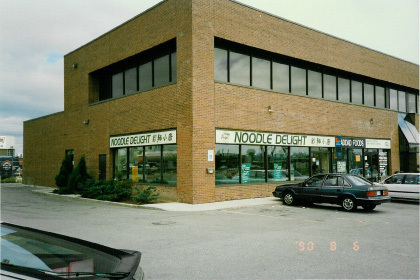 At its height, Noodle Delight had four restaurants in the Greater Toronto Area as well as one on Burnhamthrope Road in Mississauga. 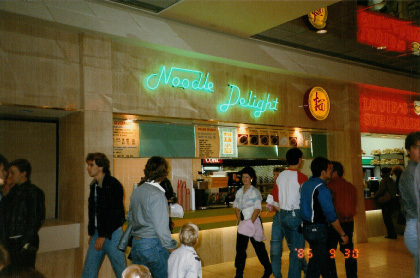 We even had one at the West Edmonton Mall in 1985. 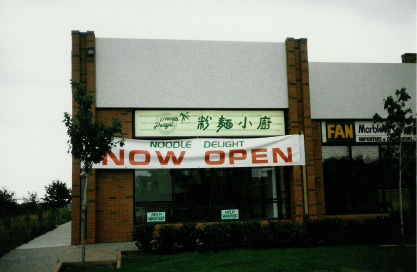 For a while, Noodle Delight went down the franchise route but it did not work out due to inconsistent quality of food and service. Victoria Park Ave. & Sheppard Ave. E.
Ellesmere Rd. & Kennedy Rd. 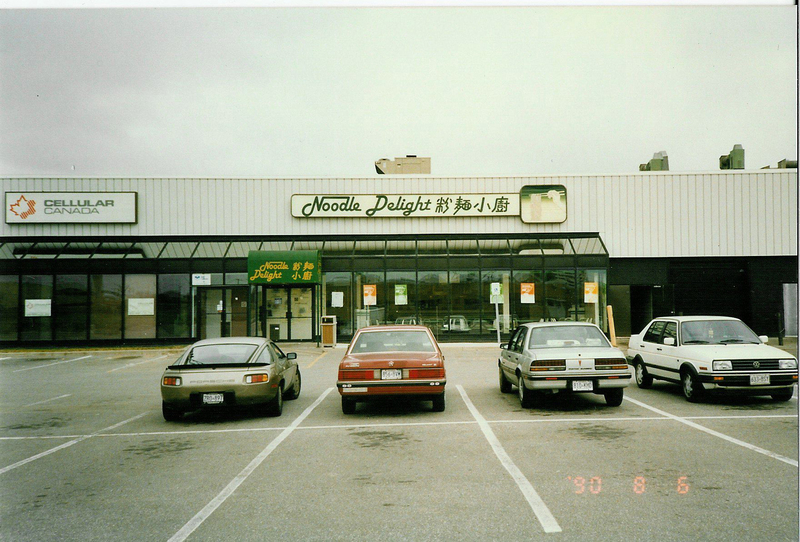 Don Mills Rd. & Eglinton Ave. E.
Finch Ave. West & Alness St.
Burnhamthrope Rd. W. & Mavis Rd. West Edmonton Mall, Edmonton, Alta. 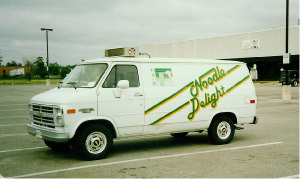 Through the years, there have been many highlights in the long history of Noodle Delight. 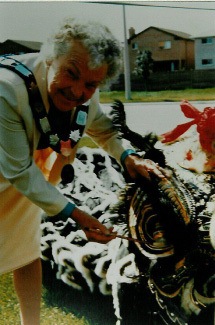 The ones that stand out the most for Mr. Lam is the one year anniversary of the opening of the Mississauga location in 1986 which featured a Chinese Lion Dance and Her Worship Mayor 'Hurricane' Hazel McCallion. 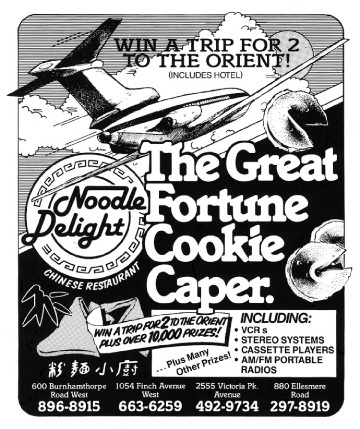 Another highlight was the contest "The Great Fortune Cookie Caper" in 1985/86, which featured fortune cookies with various prizes and a chance to win the grand prize: a trip for two to Hong Kong with flight and hotel. His Worship Mayor Gus Harris of Scaborough (1979-1987) presided over the festivities on the evening of the presentation of the grand prize. Mr. Lam is also very proud that Noodle Delight has won the Life Style Award (now called the Ontario Eat Smart Award) consistently for over five years in a row. 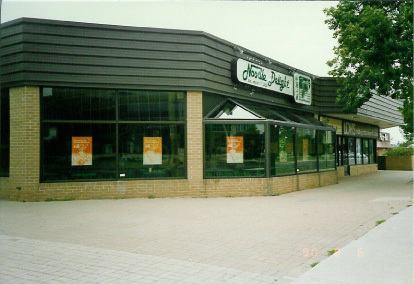 Looking at the diverse menu, one can see that there are many healthy eating options at Noodle Delight. 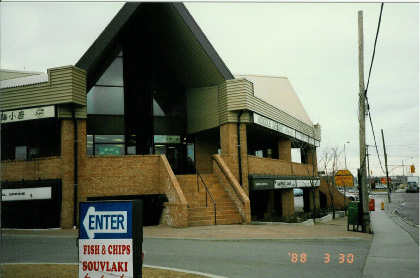 In 2004, the old Victoria Park location and its adjacent plaza was torn down to make way for a new development. 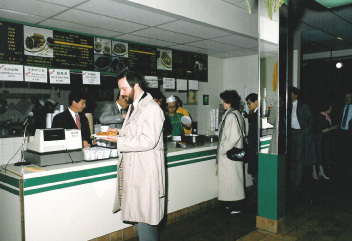 When the doors reopened for Noodle Delight, we had a new look, a new location but the same great food and service. The space is now a third smaller than the original location and we have recycled those familiar fixed seating, green and white tables. You can't abandon something so classic!